Stevenage leapfrogged Newport County and secured their League Two safety in the process with a comfortable win. Stevenage are up to 21st with Newport slipping to 22nd, still 11 points clear of the League Two drop zone. The hosts were ahead on ten minutes, Jake Mulraney heading home from Tom Pett's cross before former Newport favourite Aaron O'Connor scored against his old club. Alex Rodman fired in a late consolation for Newport. The Exiles have failed to win since 5 March and have drawn one and lost eight of their last nine, including losing six in a row for the first time in 11-years. "The points were going to be the targets for the day, and the performance would be secondary to that. "Ultimately, it was the win we wanted and the win we deserved. "I thought we were brilliant in the first half, but we were poor in the second. It felt two days long and we looked anxious and nervous. "We have been in good from lately, so we will go into next week with the belief that we can see off the problems we are facing and enjoy the rest of the season." "We lost the game in the first half today and I can take people having bad games but I can't take people having no desire and no hunger and unfortunately today in the first half we showed that. "Without a doubt it was the worst 45 minutes since I've been here. "I don't want to lose football games. "It's a mentality thing for me. You can't get into a lull of losing football matches and they've had it all season unfortunately. "I've every confidence we will stay up but you shouldn't just be buzzing to stay up." Match ends, Stevenage 2, Newport County 1. Second Half ends, Stevenage 2, Newport County 1. Dean Parrett (Stevenage) wins a free kick on the left wing. Foul by Danny Holmes (Newport County). Attempt missed. John-Christophe Ayina (Newport County) right footed shot from outside the box is just a bit too high. Attempt missed. John-Christophe Ayina (Newport County) left footed shot from outside the box is just a bit too high. Substitution, Stevenage. Dale Gorman replaces Greg Luer. Goal! Stevenage 2, Newport County 1. Alex Rodman (Newport County) right footed shot from the centre of the box to the centre of the goal. Assisted by Medy Elito. Ben Kennedy (Stevenage) wins a free kick in the attacking half. Andrew Hughes (Newport County) wins a free kick in the defensive half. Delay in match Michael Tonge (Stevenage) because of an injury. Attempt missed. Souleymane Coulibaly (Newport County) header from the centre of the box is close, but misses to the left. Dean Parrett (Stevenage) wins a free kick on the right wing. Foul by Souleymane Coulibaly (Newport County). Substitution, Stevenage. Charlie Lee replaces Jake Mulraney. Substitution, Stevenage. Ben Kennedy replaces Aaron O'Connor. 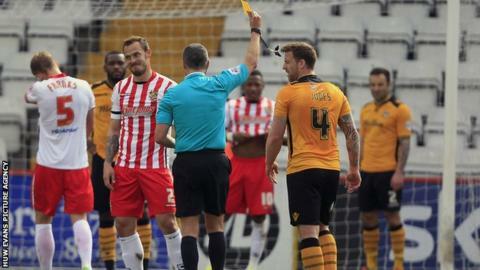 Aaron O'Connor (Stevenage) is shown the yellow card for a bad foul. Jake Mulraney (Stevenage) is shown the yellow card for a bad foul. Foul by Jake Mulraney (Stevenage). Attempt saved. Aaron O'Connor (Stevenage) right footed shot from the right side of the box is saved in the centre of the goal. Substitution, Newport County. Souleymane Coulibaly replaces Lenell John-Lewis. Attempt missed. Jake Mulraney (Stevenage) right footed shot from the centre of the box is just a bit too high. Attempt saved. Dean Wells (Stevenage) header from the left side of the box is saved in the top centre of the goal.